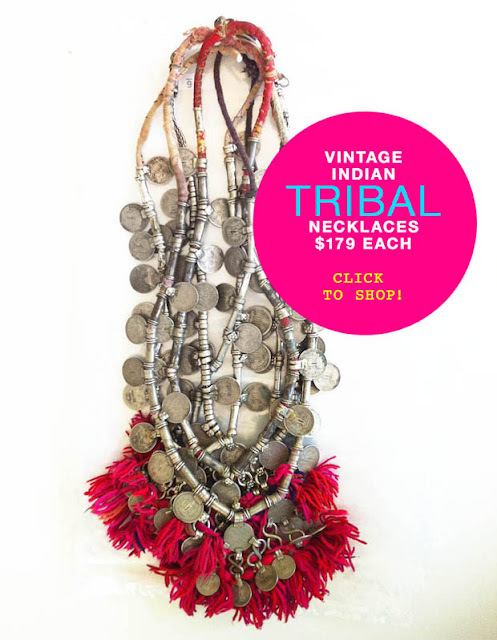 Vintage Indian Tribal Necklaces! CLICK TO SHOP! Happy Friday Tonic-ettes! It's been such a busy few weeks, I have to say, the weekends are going down very well at the moment! I'll be able to tell you more soon, but things are about to get VERY BLOODY EXCITING at TT HQ! In equally as exciting news, five (scrap that, one just sold!) four beautiful Vintage Indian tribal necklaces are now up on the Table Tonic online store. We had a few of these soon after the store launched, and they really flew out the door fast! Click to shop! Don't forget to take 20% off all Moroccan Leather Pouffes with code POUFFE20 until midnight Sunday! Happy weekend indeed!